Best academic achievement of a freshman chemistry major. Recipient is awarded a Handbook of Chemistry and Physics. Student is judged by performance in the first attempt in General Chemistry CHE 111/112. Best academic achievement of a sophomore chemistry major. The award consists of $100 to be deducted from the student’s registration fees for the next semester. The student is judged by performance in chemistry courses at EKU courses at EKU as well as overall excellence in all other courses. Best academic achievement of a junior chemistry major. The award consists of $100 to be deducted from the student’s registration fees for the next semester. The student is judged by performance in chemistry courses at EKU courses at EKU as well as overall excellence in all other courses. Awarded to the top student in the graduating class in chemistry. 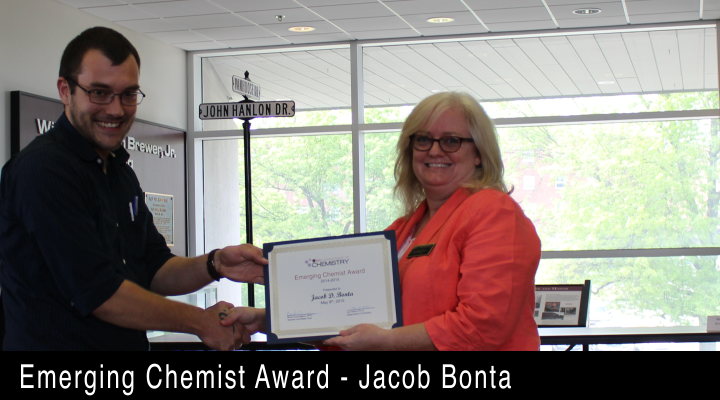 Criteria for the award include academic achievement, community service, and contributions to chemistry. 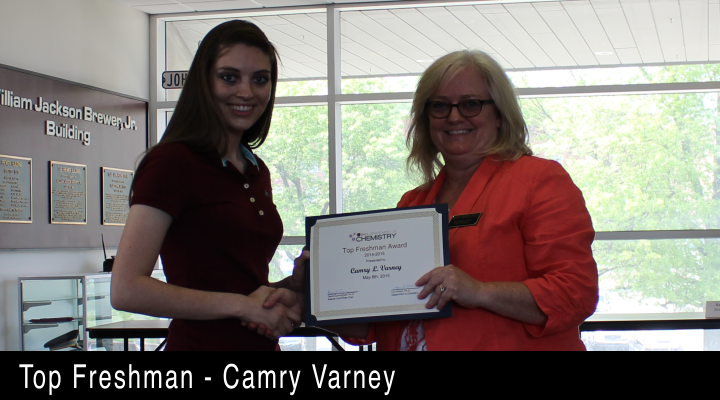 The recipient is awarded $100 in cash and recognition on a plaque in the New Science Building. 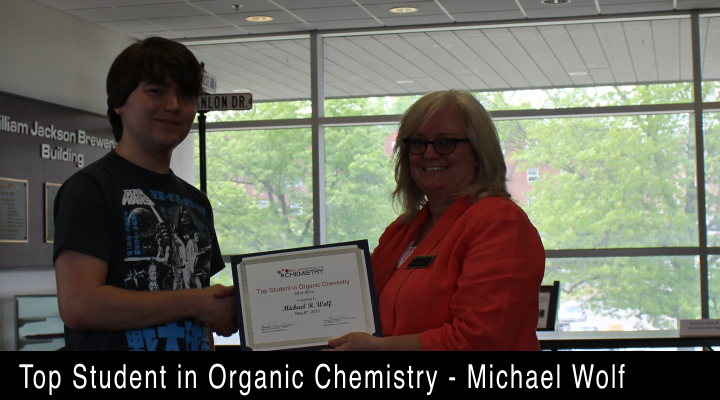 Best academic achievement in Organic Chemistry sponsored by the American Chemical Society Division of Organic Chemistry. The award consists of a letter of recognition and an award certificate. 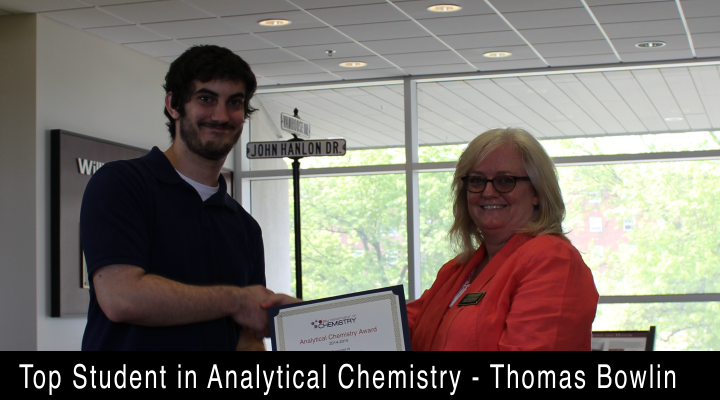 Best academic achievement in Analytical Chemistry sponsored by the American Chemical Society Division of Analytical Chemistry. The award consists of a personalized certificate, souvenir item and one-year online subscription to Analytical Chemistry. 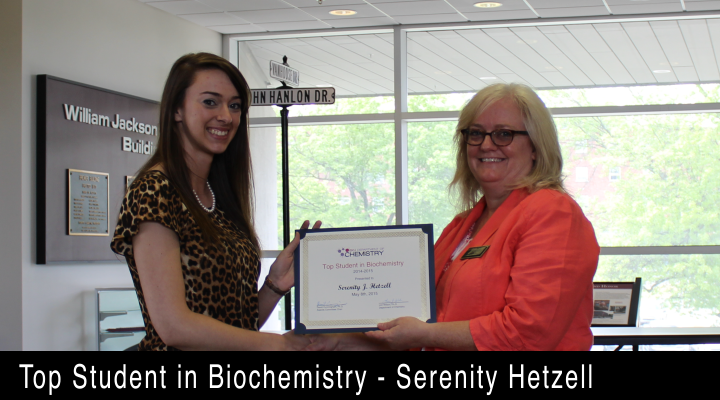 Best academic achievement in Biochemistry. 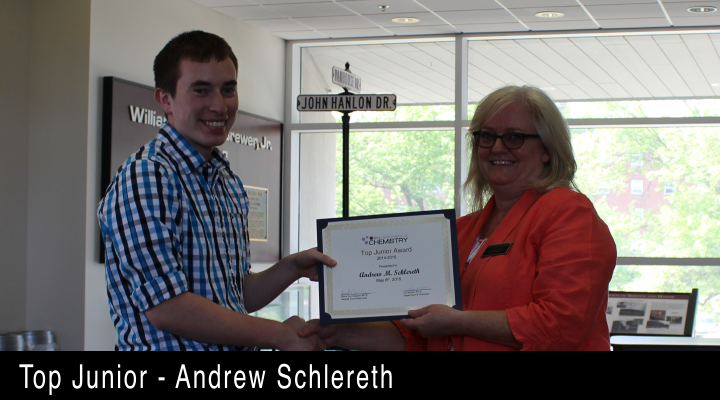 The award consists of $100 to be deducted from the student’s registration fees for the next fall semester. The student is judged by performance in biochemistry courses at EKU as well as overall excellence in all other courses. 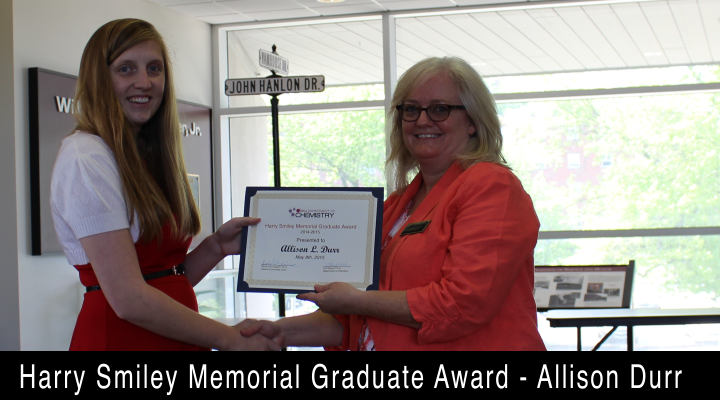 Awarded to the graduating senior who has shown the greatest potential in chemistry. 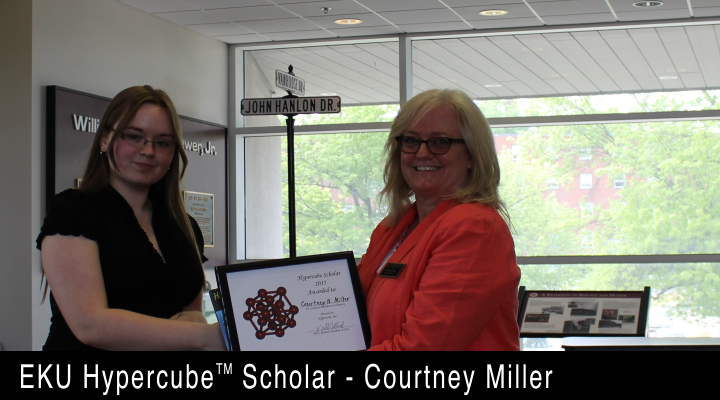 Recipient is awarded a Merck Index donated by David Igo, a graduate from the EKU Chemistry Department. The student is judged by potential in Chemistry without regard to GPA. 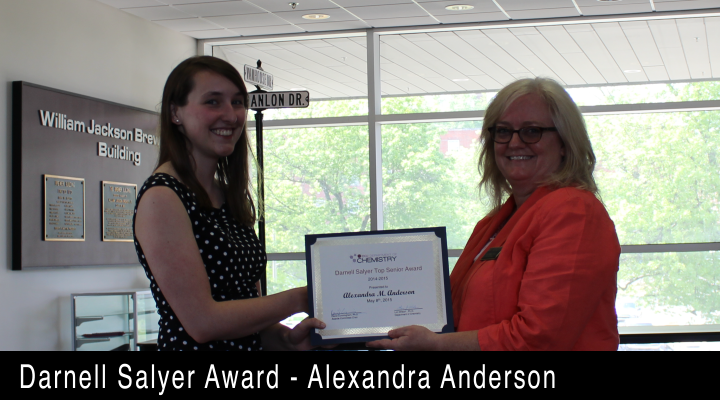 Awarded for scholastic excellence in physical chemistry. The award consists of a copy of HyperChem software and a framed certificate. 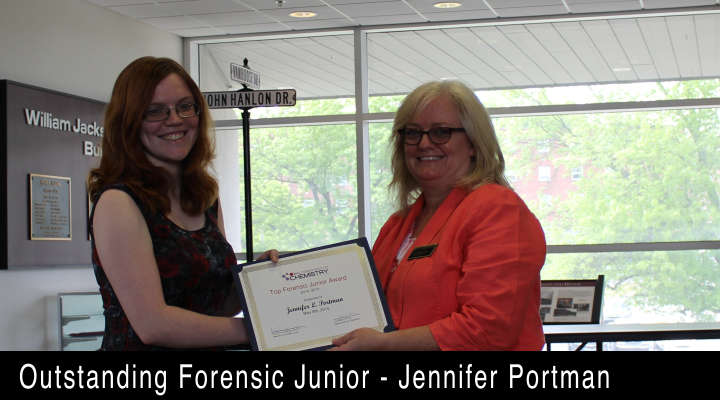 Awarded for best academic achievement of a junior forensic major, who has excelled in the classroom. This award carries an honorarium of $100. 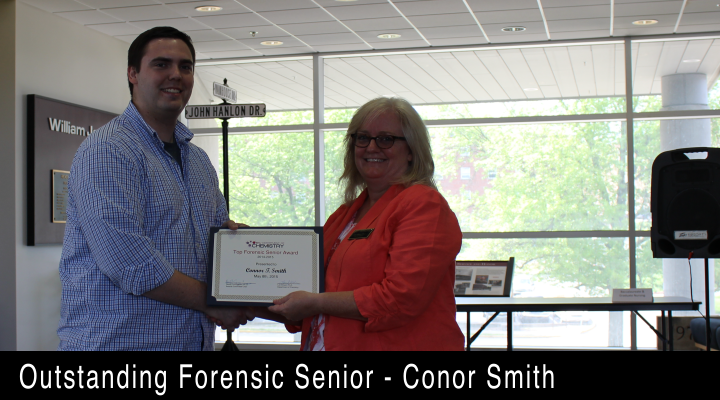 Awarded for best academic achievement of a senior forensic major, who has excelled in the classroom and shows potential for a productive career in Forensic Science. 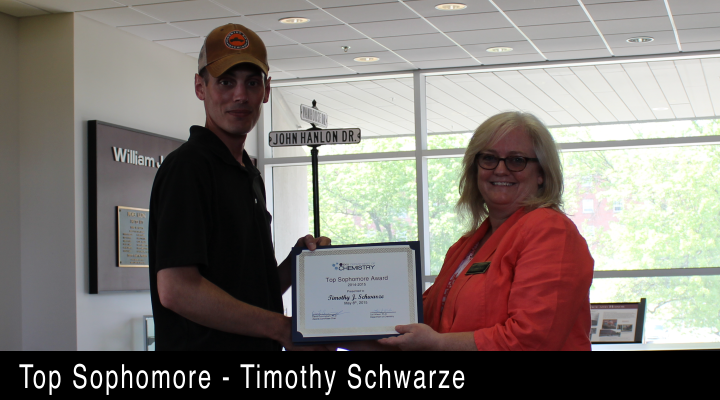 This award carries an honorarium of $100.